Star Wars: Episode VII First Behind the Scenes Image! Today it's the first day every Star Wars fan can get "officially" happy for having the first behind the scenes look at pre-production of Star Wars Episode VII. 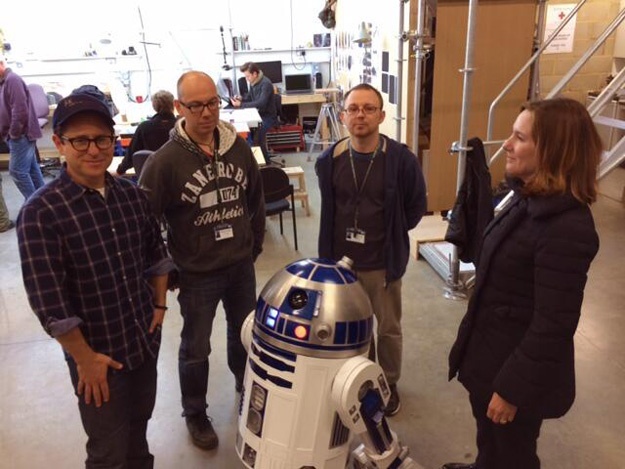 J.J. Abrams tweeted today this image featuring FEATURING R2 D2!!! Everything it's been said about returning characters but nothing is ever confirmed until we can see it or gets officially announced, R2 D2 and C3PO have appeared in all Star Wars films and it's so good to know they will be coming back. We have to thank Lucasfilm President Kathleen Kennedy and to writer-director J.J. Abrams for working so hard to bring back "a new hope" for every fan, the hope to see the Star Wars sequel we have dreamed for so long. Star Wars Episode VII has not announced an official title or cast but it is expected to arrive to our galaxy on December 18th, 2015.